There are more than one million known species of insects inhabiting our world, and many of these tiny creatures are right outside your door. Incidentally, an insect is an arthropod. To be classified as an insect, it must have a segmented body, six legs, two antennae, compound eyes, and most likely, wings. Other creatures, like spiders and scorpions are arthropods, but they are not considered insects. 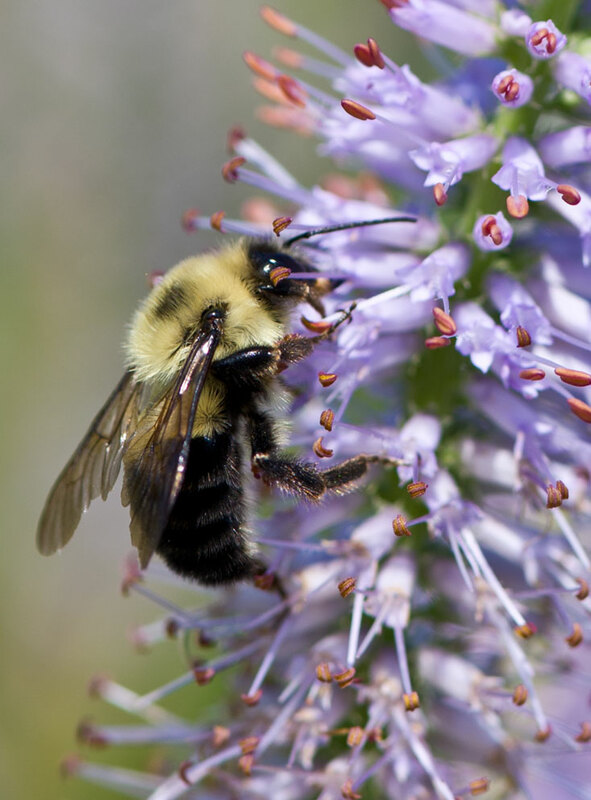 Photographing insects and other small creatures can be a lot of fun, and you need venture only as far as your backyard to find a whole new world in close-up or macro photography. The first basic rule of close-up photography is to get close to the subject. Insect photography requires a macro lens that will allow you to focus very close to the subject. A Macro lens, (Nikon calls these lenses Micro-NIKKOR lenses) lets you photograph your subjects at near life size. You’re also going to want to use a tripod to steady the camera, especially when you’re using a telephoto lens or long shutter speed. When shooting with your camera on a tripod, using a cable release to trip the shutter is the ideal shooting method. Some photographers will go the added step of locking up the mirror on their D-SLR prior to tripping the shutter. This further reduces the possibility of movement. If you don’t have a cable release, you can use the camera’s self-timer instead. Depending on how close you can get, you will be able to fill the frame with the entire insect’s body, or a portion of its body such as its head and antennae. Be cautious so you don’t get stung. D600, AF-S DX Micro-NIKKOR 40mm f/2.8G, 1/100 second, f/5, ISO 800, program, Matrix metering. 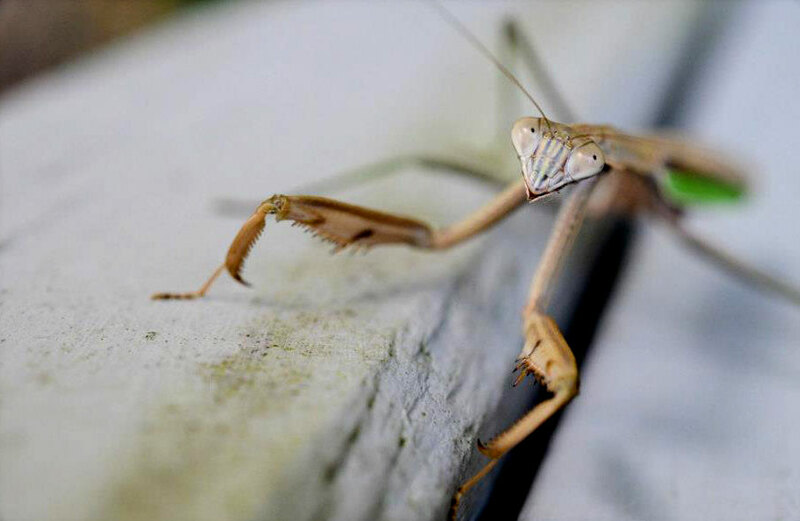 Slow moving insects such as this Praying Mantis make great subjects. The photographer was able to follow it, as it made its way around the fence railing, taking lots of photos at various angles. Insects have fascinating bodies, and one of the goals of close-up nature photography is to bring out all the color and detail of insect life. Good macro photography puts the camera’s focus on the eyes, legs and bodies of these bugs, and their tiny world. For example, taking a photograph of a spider in its web tells a more interesting story. Background color plays an important role in composition. For example, if the subject is dark colored, as many insects are, a lighter, out-of-focus background will make the creature stand out from its surroundings and focus the viewers’ attention on it. The technique for getting an insect to stand out from the background is to use a shallow depth of field. Depth of field is defined as the area in front of, and behind the subject, that is in focus. Depth of field is determined by the aperture setting. Low f/stops, like f/2.8 will give you a shallow depth of field, which pinpoints the focus on your subject, while the background goes out of focus. Another technique that nature photographers use is to position their camera so that a brightly lit subject is photographed against a dark background. Exposing for a well-lit subject, under full daylight for example, or with a fill-flash, will cause a dark background to underexpose and approach black. This effect creates a dark, even background, making the subject stand out. But if the subject and background are both brightly lit, the insect may be difficult to separate from its surroundings. Placing a household item like a piece of cloth or paper behind the subject can work as a portable studio backdrop, isolating the bug against a plain background and setting it apart from its surroundings. Insects are more mobile in warm weather, so photograph them in the early morning or evening when it is cooler, and they will be moving slower. The available light at those times of day will also be more flattering too. D3S, AF-S VR Micro-NIKKOR 105mm f/2.8G IF-ED, 1/1000 second, f/5.6, ISO 200, manual, Matrix metering. 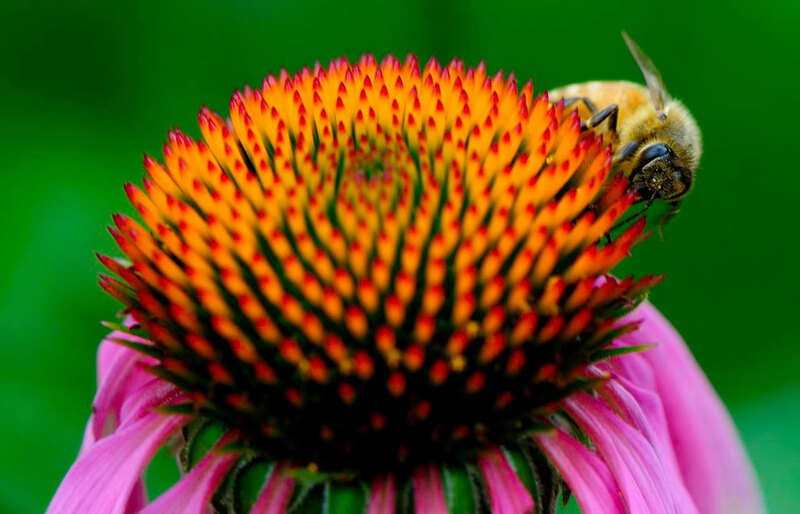 This is the same photo of the bee on the flower that is shown at left, but cropped. While its great to compose the image completely in the camera, remember that you can always crop it, or experiment in other ways on the computer. As in all photography, keeping your close-up images simple can give you the most dramatic and beautiful results. Patience and persistence will pay off. Good depth of field and isolating your subject are two points to remember for great macro photography. D7000, AF-S DX Micro-NIKKOR 40mm f/2.8G, 1/125 second, f/7.1, ISO 400, aperture priority, Matrix metering. 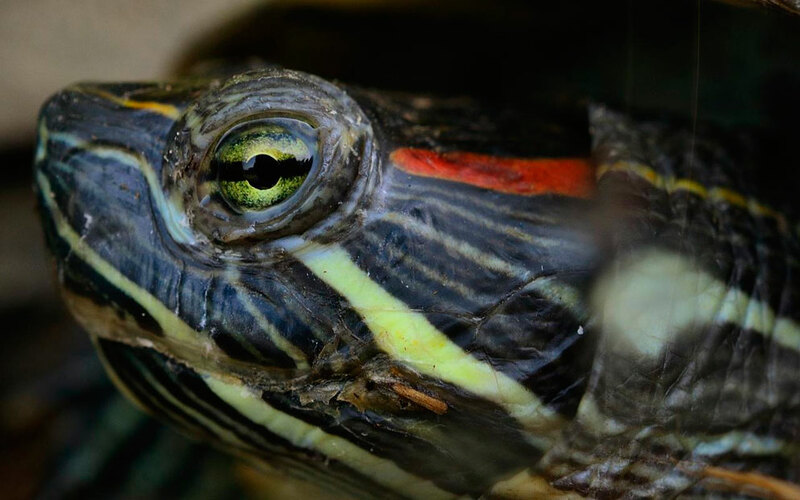 Getting up close to subjects behind glass can make for great photos. Watch out for glare caused by the glass. Change your shooting angle or add a polarizing filter onto the lens to get rid of the glare.